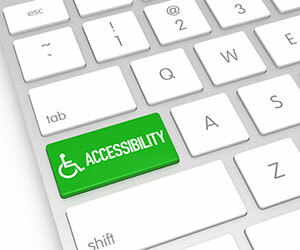 › iAdControl Blog › Why accessibility and usability matters with web design? Those of us who began using the Internet at the turn of the millennium know all about flashy web page designs. Cyberspace was full of websites that focused more on multimedia, flash and graphics and less on content; back then it worked. In 2014, the opposite is now true and instead, minimalistic designs with an emphasis on content that the visitor can access and read in seconds is what works. At iAdControl, we are committed to producing websites that not only look good but also are effective in what they are designed to do. So why is accessibility so important these days? Unless you have an innovative idea that has never been thought of before, the online market for every product or service is vast. It isn’t just about standing out on search engines; it is also about providing a straightforward, safe, and easy way for consumers to visit your website and make a purchase. This is why we recommend keeping things simple. Our one-page brochure websites for example, are straight to the point and don’t mess about. You need to compete well with the other online businesses in your market sector, and you can do this by having a well-designed website. Think about every time you have bought something online. Have you spent ages researching it or simply made an impulse buy? Most consumers will spend some time researching a product or service but they don’t want this to take an age. Your website should be, as we have already pointed out, straight to the point. It should list the benefits of your product and/or service and allow visitors to find information fast. Consumers don’t have time, patience or the need to wait for memory hogging graphics to load or to spend hours going through web pages that all essentially say the same thing. Quick and straightforward content is key. It isn’t enough either to simply have a smart website that loads and reads well on a laptop computer. For the first time people are accessing the Internet from more devices than a PC or laptop and this includes smartphones and tablets. With our expertise and knowledge, we can turn your website into one that can be accessed and used on virtually any internet capable device. This means that you can reach out to a whole new audience that hardly ever browse or shop on a ‘traditional’ computer. You will gain valuable exposure and appeal to a section of the market that you couldn’t tap into before. Web design in 2014 is far different to that of even 5 years ago. Flashy graphics, over the top designs and duplicate content are now gone, replaced by simple, straight to the point, smart websites. If you want your business to reach its potential then iAdControl can help by creating an effective storefront open 24/7 all year round! Offer ›› For a free 20 minute website consultation over the phone - quote 'iAdControlWebsite' today.